Eich Roller Bearings have proven themselves over decades. The flexible Bush Bearings were gradually optimized and adjusted. In this optimization process, a special bearing type was developed which we offer in various designs today. The ABC bearing of the company Eich is characterized by several factors. The ABC bearing with the so-called Anti Blocking Cage is a special form of spring bush bearing which is different to the standard roller cage assembly. The ABC bearing has a snap cage instead. The lid of the cage snaps over a tongue and groove principle. This bearing is therefore particularly well suited for continuous casting. Due to its design, snap cage called roll cage is equipped with a rotatable, side ring, which can absorb axial forces well. As a result, the ABC bearing acts as a radial bearing in addition to its function as a radial bearing and retains its functionality even at high torsional force so a high axial force. Eich types BR and ABC the so called Flexible Bush Bearings are a specific kind the rings of which are not made of solid steel, as usual, but of specific wound strip steel. This qualifies the Flexible Bush Bearings especially for challenging operating conditions. What are the advantages of having an ABC bearing? Our optimized new generation of ABC bearings has a number of special features that set it apart. The new modular system of the ABC bearings can absorb emerging torsional forces and reduce the peak load while raising the load rating. This is done by the higher and better distribution of the rolling elements in the same space compared to other bearings. 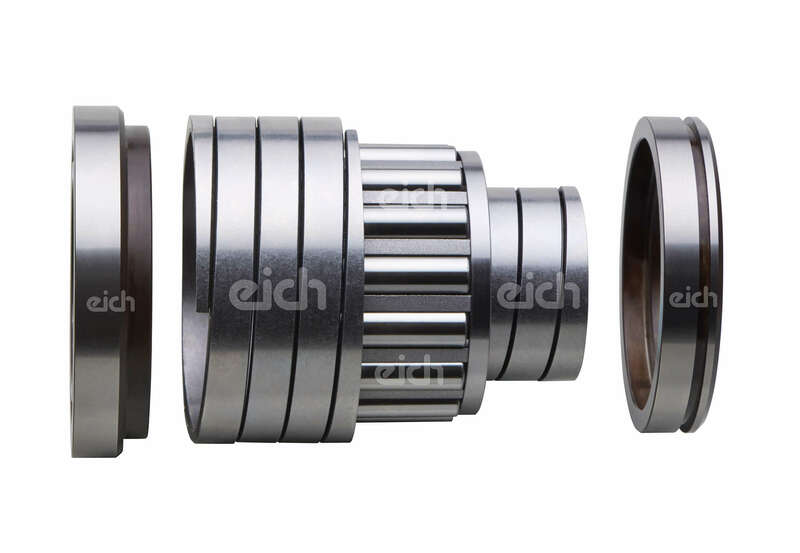 In addition, the ABC bearing of the company Eich proves to be particularly heat-resistant and can also be used at high operating temperatures. In addition, it has a low dirt sensitivity. This results from the winding of the spring, as is the case with other spring sleeve bearings. Due to the innovative construction of the ABC bearing different heights and diameters can be realized. Even small ABC bearings are feasible. For the right size for your system, please do not hesitate to contact us by phone or e-mail and we will gladly advise you which bearing of which size is suitable for you. Due to the modular design of the flexible spring bush bearings, the modular bearings can be put together individually and elements can be replaced easily in the event of damage. Please feel free to contact our service department.